Ron Fraser called Randy Guerra "one of the most reliable and best to do it all players I ever coached". And do it all certainly describes Randy. He was a pitcher, an outfielder, a first baseman and designated hitter. 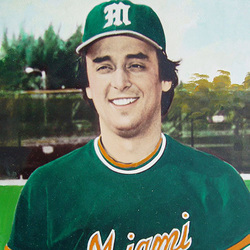 As a pitcher, he cpompiled a 20-4 career maek and made the All-College World Series team in 1978 as a result of his two starts. A year later he hit two homes runs in the College World Series. The 1979 College World Series capped off a senior season that saw him hit .315, with 15 home runs and 64 RBI's, giving him 28 home runs in his last two seasons as Hurricane. It also capped off a career that saw his number retired. A native of New Jersey, Randy earned All-State basketball and baseball honors at Linden High School and he was also named to the All-Tri State, New York, New Jersey and Connecticut, by the New York Daily News. Following his great UM career Guerra played in the New York Yankees system. Sadly, Randy Guerra passed away on July 4, 2018.